MADRID, SPAIN - Around 600 participants from 52 countries gathered at the 4th UNWTO World Forum on Gastronomy Tourism (Bangkok, Thailand, 30 May to 1 June 2018). 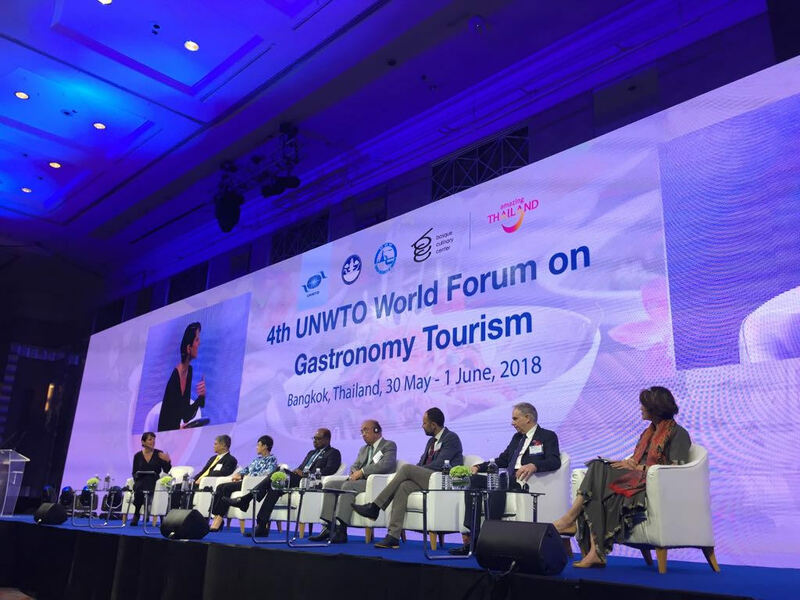 Organized by the World Tourism Organization (UNWTO) and the Government of Thailand, in collaboration with the Basque Culinary Center, participants addressed topics ranging from the role of technology in achieving sustainable development, to linking the whole tourism value chain to gastronomy. Partnering with technology providers is among UNWTO’s main priorities. Against this backdrop, creating and sharing knowledge and policy lessons on the digital transformation was among the central aspects of this year’s edition, which included the participation of technology startups of the host country (Bangkok Food Tours, HiveSters, LocalAlike and Trawell). The startups presented workshops to all participants focusing on the gastronomy tourism offer in Thailand, how to use technology to better reach tourists and showcasing their initiatives. “Gastronomy is a major driver for tourists when choosing a destination, inspite of which the potential of gastronomy tourism has still to be seized as an intangible cultural heritage. Gastronomy tourism is about harnessing technology to tell a story about people and places to preserve and promote authenticity in local communities”, added UNWTO Secretary-General, Zurab Pololikashvili. The Minister of Tourism and Sports of Thailand, Mr. Weerasak Kowsurat, underscored how “local communities can strengthen themselves and feel proud of their culture through gastronomy tourism. Referring to the overall economic impact, he added that “agriculture and tourism are significant job creators throughout the country, and Thai cuisine helps us boost tourism expenditure”. On the occasion, UNWTO launched the Report on Gastronomy Tourism: The Case of Japan. The 2019 edition of the UNWTO World Forum on Gastronomy Tourism will take place in San Sebastian, Spain followed by Flandres, Belgium, in 2020. Αναρτήθηκε από geop στις 11:08 π.μ.